I’ve never revisited or republished a recipe on this blog before, but I’m sharing a revamped recipe with you today. I made pad thai recently for dinner and after sharing it on instagram and facebook, I got many requests for the recipe. So I reviewed my old recipe to see if it still held up. Well, that old post was from 2008. That’s almost prehistoric for blog history. So I decided to clean it up a bit. It’s still the same basic ingredients. I’ve had seven years of pad thai practice, both the cooking and the eating. So I think it’s time. Red Boat fish sauce, one of the best anchovy-based fish sauces out there, released a kosher fish sauce, so now, kosher pad thai dreams can really come true for everyone. I visited a new local to me Asian market on Sunday, so I had just replenished my supply of rice noodles and other goodies, so this week has been filled with various Thai and Chinese treats. The important thing about pad thai is having everything ready to go when you want to start cooking. Everything cooks quickly. Start by cooking the pad thai sauce in a small sauce pan. You will want to mix equal parts brown sugar, fish sauce and tamarind concentrate. To that mixture, you will add some vegetable or chicken broth. Boil the mixture and then let it simmer so it can thicken. While the sauce is cooking, get your rice noodles ready. 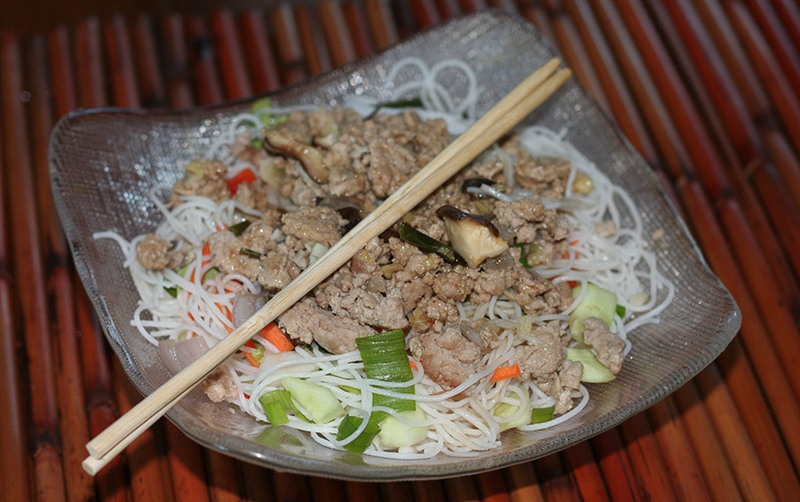 Fresh rice noodles are amazing, but the dried rice sticks work fine and are simple to cook. Just submerge the noodles in boiling and let them sit for several minutes until soft. Drain and then rinse with cold water until ready to use. I beat up some eggs and let them cook in a pan. I set those aside. Next, I sauteed up some shallots and garlic and then added some tofu and chicken style seitan to the pan. Then, I added some Chinese broccoli and some shiitake mushrooms to the pan. I let those cook a few minutes. Next, I added the rice noodles to the pan and stirred in the sauce. After everything was incorporated, I stirred in some bean sprouts and scallions and got ready to plate it. Serve the finished pad thai with some crushed up peanuts and lime wedges. I love what the lime juice does to this dish. Combine the fish sauce, brown sugar and tamarind concentrate in a small sauce pan. Heat on medium. Add in the broth. Let it come to a boil and then turn the heat down. Soak the rice noodles in boiling water until soft. Drain and set aside. Heat up a couple of teaspoons of canola oil in a wok or large pan. Beat the eggs and add to the pan. Scramble them a bit. Transfer eggs to plate and set aside. Add another teaspoon or two of oil to the hot pan and add your proteins. I like adding tofu or seitan, but feel free to play around with it. Add some beef or chicken or shrimp if that's more your speed. Let it cook a few minutes. Add in some veggies. This is where I added mushrooms and broccoli. Let that cook a bit. Now, add the noodles to the pan and stir. Finally, add the bean sprouts and the scallions and turn off the heat. Serve pad thai topped with some peanuts and some lime wedges on the side. I love fresh squeezed lime juice on mine!